Successfully Added Windscreen-Mounted Night Vision Car DVR to your Shopping Cart. 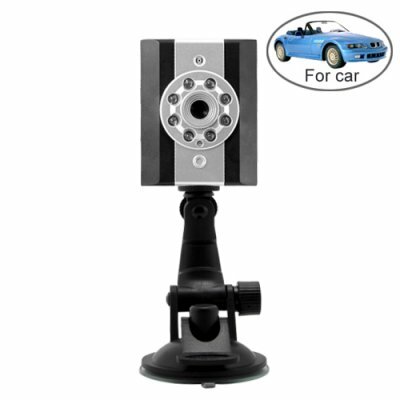 Day or night, use this car digital video recorder to conveniently record while driving. record videos in computer friendly AVI format at 28 frames per second. With this car digital video recorder you can even record video when driving at night thanks to the Infrared (IR) sensor. Every been blamed for running a red light? When in fact you haven't. Well, there is only one way to prove that, and that is by installing this vehicle video recorder which also has a built in infra red sensor with 8 LED's to help you capture video when driving at night or low light conditions. This video camera is designed to be mounted on you car's windshield so that you may capture video of road situations. Start up your car, hit the one-click record button, and off you go, a whole day of road events being recorded as they happen. This is a and extremely useful camera for insurance, security or even law enforcement purposes. The CVLL-G139 records in computer friendly AVI video files at 28FPS (640x480), meaning, you can instantly view them on your computer without the need to convert them to any other video format. Further-more, this model CVLL-G139 comes with a TV out, which lets you hook it up to an LCD monitor already installed in you car, or simply connect it using the 2.5mm to RCA cable provided to your TV and see what you've been recording. The CVLL-G139 is a must have item if you drive or own a car, and is in stock right now. Get yours today and an incredible factory direct wholesale price, straight from the the leaders in consumer wholesale electronics, Chinavasion. What is the difference between this particular model (CVLL-G139) and others I have seen on the market? fast shipping, good product but would benefit from a small screen on the back, also a case to carry it in would be good. Does not work well in shadows on a sunny day. Good night vision. does what it says on the box. I will bye more. - good picture, good sensibility for evening and night driving. - IR-mode really works and is useful. - Advice: use FAT with big cluster not FAT32 for SD cards - this will make pause between files minimal (1 to 2 seconds) against 8 to 10 seconds when a big capaciry card with FAT32 is used. - Mount is convenient but don't hide DVR behind rearview mirror so I used my own, more compact. great for recording your travels. records and date time stamp your recording if you know how to program it.